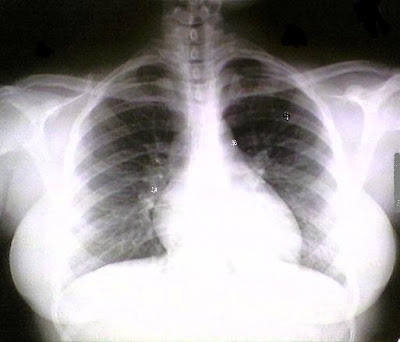 The Emmerson Biggins sign is clearly demonstrated on this Xray by symmetric soft-tissue densities that project laterally from the mid chest. This poor young woman is burdened by a certain top-heaviness, a certain tendency to fall forward, and a tendency for her condition to draw the stares of construction workers, auto-mechanics, fraternity members, heterosexual men, and jealous women. In extreme cases the patient may suffer from chronic low back pain and need orthopedic consultation for bracing and counter-weighting to correct problems with ambulation and navigating narrow doorways. Research is ongoing but, for some reason, funding is hard to come by. This affliction has gained some notoriety in the press from it's most famous victims, Dolly Parton and Dixie Dynamite, who have managed to parlay it into a career. Damn, I'm getting slow. I almost googled "Emmerson Biggins sign" before I read it again and figured it out. Bummre for the lady, though. THemmons ain't just big, they is perky! I want to wear those like a russian hat. It also took me a few to figure out the "Emmerson Biggins" sign. dirty, yes. old, not so much but getting closer every day. "Check out the funbags on that hosehound." Warning: The posted terminology is for use by us Medical Professionals only. The rest of you should make up your own tittilating terminology!